Mike Ramsdell is an author who used his career in military intelligence as the source of his novels. Ramsdell was born and raised in Bear River, Utah. He served as a missionary to Germany for The Church of Jesus Christ of Latter-day Saints, of which he is a member. He earned a degree from Utah State University and was then commissioned as an officer in the U.S. Military Intelligence Corps. He did post-graduate work at the University of Utah, eventually earning a law degree, and graduated from the Defense Language Institute with Russian and German. During active duty, he worked in Russian and Soviet counterintelligence that took him on missions throughout Russia, Scandinavia, Europe, and Asia. His final foreign assignment was in Gorky and Moscow for six years. He worked for various government intelligence agencies and the State Department during his 30-year career. 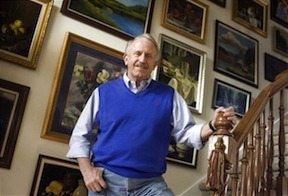 When he turned 60 years old in 2002, he and his wife, Bonnie, retired to northern Utah. After a racquetball accident that left him with a fractured neck, he began writing about his experiences in Russia. The end result was his first book, A Train to Potevka, which he self-published. Costco became his main distributor. His miraculous story became popular with readers throughout the Intermountain West, and Ramsdell was asked to speak at church, civic, and corporate functions. Kieth Merrill is turning the book into a film. A literary agent took the book and helped it become a national bestseller. In 2007, the National Steinbeck Center honored him. Ramsdell wrote a sequel of 25 short stories called Potevka’s Gifts. He hopes to write a third book that details the final two years of his career that ended in him mistakenly being called a traitor. The movie Breach is about the FBI agent who was eventually caught as the person who was selling secrets. This page was last edited on 29 January 2016, at 15:29.